Along with perennial food favorites like Fletcher’s Corny Dogs, the State Fair of Texas has became famous for their fried foods. 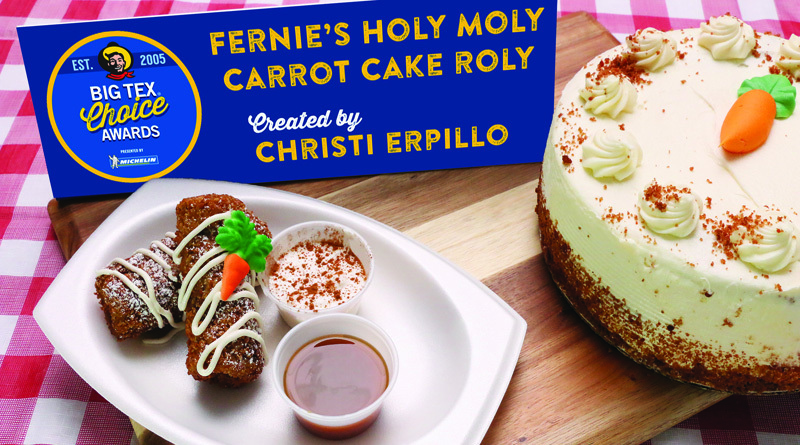 Winners of this year’s competition of the Big Tex Choice Awards August 30 were Fernie’s Holy Moly Carrot Cake Roly by Christi Erpillo, which won the top award for Best Tasting, and the Smoky Bacon Margarita, winning Most Creative. My husband and I, along with media friends and some folks who had purchased $100 tickets to be among the first to taste these concoctions, were entertained by watching celebrity judges like former Cowboy Drew Pearson, Mavs point guard Devis Harris, and Chef John Tesar along with emcee Donovan Lewis from The Ticket Radio Station deliberate over the eight finalists. 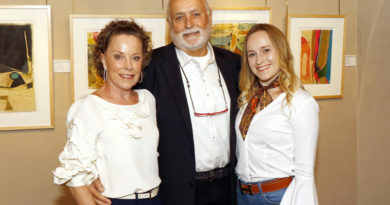 There were more than 50 entries in the first round of the competition, gradually narrowed down to the eight finalists for Best Tasting and Most Creative. These eight included Chicken Fried Lobster with Champagne Gravy by Abel Gonzales, Cowboy Corn Crunch by Isaac Rousso, Deep Fried Alligator’s Egg Nest by Cassy Jones, Fried Beer-Battered Buffalo by Jaems Barrera, Lone Star Pork Handle by Justin Martinez, Pretzel-Crusted Pollo Queso by Allan Weiss, plus the two winning entries. The Most Creative winner was the Smoky Bacon Margarita by Isaac Rousso. Also capitalizing on America’s love of all things bacon, the Ed Campbell Concession Company will introduce Baconation at this year’s fair in a booth just inside the air-conditioned Tower Building. My husband and I were recently treated to a tasting of their sizzling bacon novelties, served on a stick. My favorite was the maple brown sugar, but he loved the milk chocolate pecan bacon. They also have coconut white chocolate and even BLT nachos. Baconation will also have craft beer from Peticolas Brewing Company, featuring their new creation, “Come and Take It” or award-winning favorite “Great Scot!” with your bacon selection. The Ed Campbell Concession Company also operates the historic Old Mill Inn, which celebrates its 80th anniversary at the fair. They will showcase their delicious homemade biscuit sandwich baskets and birthday cake during this year’s State Fair.